This book is different from stories I usually read, and the author did warn me. But I was still surprised, both by the tale itself, and by how much I enjoyed the journey of these odd yet fascinating characters! I took so many notes and I'm not sure where to begin... The story went in a lot of unexpected directions, and it didn't really start to come together until about a quarter of the way through. But it was a well thought out tale, and one that held my interest! 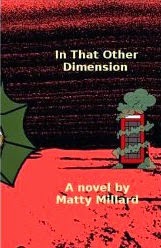 We learn that every red telephone box in England contains a portal to a parallel dimension, and once our travelers embark on a journey all sorts of strange events unfold. From the villages made of cake and candy, to the giant unicorn mountain, each world is intriguing, and rich with detail. And the obstacles they face on their journey are filled with humor, terror, and adventure! Carlos and Maria, who were well acquainted in England, reunite in another dimension, and -- along with a hyena, a turtle, a baby cake dragon, and others -- attempt to defeat the evil scientist, Dr. Funk, who is out to destroy one of the dimensions along the way. But the hurdles are great, and the manner in which they must go about saving the land is as unconventional as the rest of the story. An adventurous fantasy that would appeal to anyone who enjoys a story that is truly an escape from reality!